The Yaskawa Group emits CO2 and waste materials as a result of using energy, such as electricity, gas, etc., and resources, such as components/materials, water, etc., for manufacturing, sales, engineering, etc., of electrical products and systems, and other related businesses. The above figure illustrates the status of environmental loads of our production and sales activities. We also manage the amount of energy used, CO2 emissions, and amounts of waste materials and valuables generated from business activities of our domestic and international group companies. The scope of management targets group companies of high energy usage amount (accounting for approximately 90% of the energy used by the entire group) and two business units have presently been added as targets. Going forward, we shall expand the scope of management to 100% and promote the reduction of environmental loads. The graph at the right shows the energy-derived CO2 emissions of the Yaskawa Group in FY2017. Yaskawa conducted activities to promote conservation objectives, aiming at a “10% reduction (versus FY2012) in energy consumption per unit of production volume” targeted in its 2018 mid-term environmental plan. In FY2017, the improvement effects of energy-saving investments and the enhanced operating efficiency of facilities resulted in a 16.5% reduction compared with FY2012. As commitments toward energy conservation, automatic control of air-conditioning by utilizing IoT, review of compressor air pressure, strengthening of air leakage inspection, etc., were implemented, in addition to upgrades in lighting and air-conditioners. Also, as a commitment toward energy creation, approximately 750kW of solar power generating facilities were introduced, which made the renewable energy rate 3.8%. Note: The conversion factor is of 0.42 kg-CO2/kWh used for calculation of CO2 emissions from electric power. Initiatives were made to introduce thorough separations of refuse to enable efficient recycling of unused items, vendors were cultivated, and the company succeeded in maintaining zero emissions for industrial waste. A change in work clothes resulted in the mass generation of work wear, which were offered free of charge for reuse as automotive upholstery. 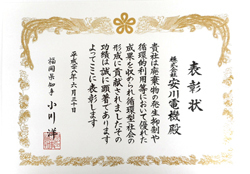 These activities were recognized with the awarding of the Fukuoka governor’s award for outstanding efforts to promote a recycling-oriented society and a prize offered by the city of Kitakyushu for the promotion of 3R activities (a recycling award). High-purity IPA had been discarded from the Yaskawa Controls’ Bestact manufacturing line in the Yukuhashi Plant. As a result of a review conducted by the group companies within Yukuhashi Plant, mainly centering on Yaskawa Electric, reuse of IPA was started because the quality of IPA used in Yaskawa Electric Engineering’s repair process could be ensured. Consequently, the activities resulted in significant improvement in the amount of IPA discarded from 3,500 liters per year to 500 liters per year.